How did a guy with an electrical engineering degree from MIT wind up at the National Library of Medicine? At the time Sheehan was at the Massachusetts Institute of Technology, Commodore computers were best sellers, and the Commodores were big on the radio. The idea he would one day find the ultimate career at NLM never could have occurred to the young man. After graduating from MIT, you could say that Sheehan took the road less traveled. Large corporations like Microsoft and Intel were actively recruiting at MIT, but he wasn’t interested. Instead, Sheehan moved to Washington, DC, to accept a position at a small consulting firm that he said worked “in the national interest,” meaning mostly the Department of Defense. He worked on computing and radar systems and became fascinated with how you can apply technology to large problems. In addition to gaining experience in systems engineering, Sheehan learned about government contracting and saw firsthand how decisions about the creation and deployment of new technologies weren’t based solely on technical considerations. Cost and operational considerations, along with policy and politics, played into those decisions. Sheehan enjoyed his job and living in Washington, but graduate school was always part of his plan. “My early work experiences taught me that I wanted an interdisciplinary program that had science, technology, and engineering at its core,” he said. By the time he graduated with a master’s degree in technology and policy in 1991, he needed to go back to Washington. “For someone with my interests and skills set, DC was the place to be,” he explained. Having phone calls returned turned out to be personally important to Sheehan in 1995, when funding for the OTA ended and he needed a new job. “The National Academy of Sciences just got in a project on privacy and security of electronic health records, and they needed someone to manage it,” said Sheehan. “The project was sponsored by an organization I hadn’t interacted with before called the National Library of Medicine,” said Sheehan with a smile. Sheehan was study director and program officer for this 1997 report from the National Academy of Sciences. To address this question, Sheehan assembled a panel of experts to provide independent advice. Sheehan’s liaison at NLM was Betsy Humphreys, former deputy director of the Library. “We came up with a set of recommendations—requirements for everyone who touched clinical care information in an electronic way—to protect privacy and confidentiality,” Sheehan said. In 1997, when the panel was ready to release its report, For the Record: Protecting Electronic Health Information, Sheehan received some unsolicited advice. He recalled, “Out of the blue, I got a call from Betsy Humphreys. It was very unusual for a sponsor to contact you about a press release, but as always with Betsy, what she said made a lot of sense.” Together, Sheehan and Humphreys put together a grand announcement about the report. Sheehan worked with a stellar team that included many professionals who would later have leadership positions at NLM, including current NLM Director Dr. Patricia Flatley Brennan, Director of Extramural Programs Dr. Valerie Florance, and Dr. Daniel Masys, a member of the NLM Board of Regents and co-chair of the Library’s strategic planning initiative. The team’s final report, Networking Health: Prescriptions for the Internet, was released in 2000. He might have stayed at the Academy, if it weren’t for Paris. Through previous contacts, Sheehan was enticed to join the Organisation for Economic Co-operation and Development (OECD) in Paris. The OECD provides a forum for governments to work together to share experiences and seek solutions to common problems. “I ran a unit that did work on science and innovation policy,” explained Sheehan. What started out as a two-year assignment turned into a six-year position. He just wasn’t sure when he would return to the US until got a call from a former colleague at NLM. Jane Bortnick Griffith, the assistant director for policy development at NLM, let Sheehan know that she would be retiring. Her job would be open. Sheehan desired to be positioned on that cutting edge. He applied for the position and started at NLM in September of 2006. He was responsible for monitoring, evaluating, and advising on science, technology, and policy issues. “I knew some of NLM from my work, but I didn’t know all of NLM,” confessed Sheehan. “I continued to be impressed with all of the things that NLM did and the diversity of professions and skill sets of the people. Late in 2015, Sheehan was approached by the White House about doing a detail or short-term assignment in the White House Office of Science and Technology Policy (OSTP). Sheehan presents at the NLM Board of Regents meeting February 8, 2017. For 16 months, Sheehan commuted to the Eisenhower Executive Office Building, next to the West Wing of the White House. At OSTP, Sheehan helped agencies develop plans for public access data and chaired an interagency working group on open science. Working at the White House was cool from both a professional and personal point of view. “Interspersed with interagency meetings were ceremonial events in the White House or on the South Lawn,” he said. And then there was that time he nearly bumped into Joe Biden as the vice president was on his way to a Cancer Moonshot meeting. Yet as invigorating as the White House work was, Sheehan was eager to return to NLM. In 2016, three things were happening at NLM that were particularly appealing to Sheehan. There was the NIH push for NLM to become hub of data science, Dr. Brennan was coming on board as director, and the Library’s strategic planning process was underway. Even though Sheehan had worked closely with Betsy Humphreys and interviewed for the job of deputy director, it was hard for him to imagine stepping into the position. “It would be a different role for me, being involved in more operational aspects of the Library as opposed to policy ones,” he said. Great news, indeed, to many who’ve seen Jerry Sheehan in action. 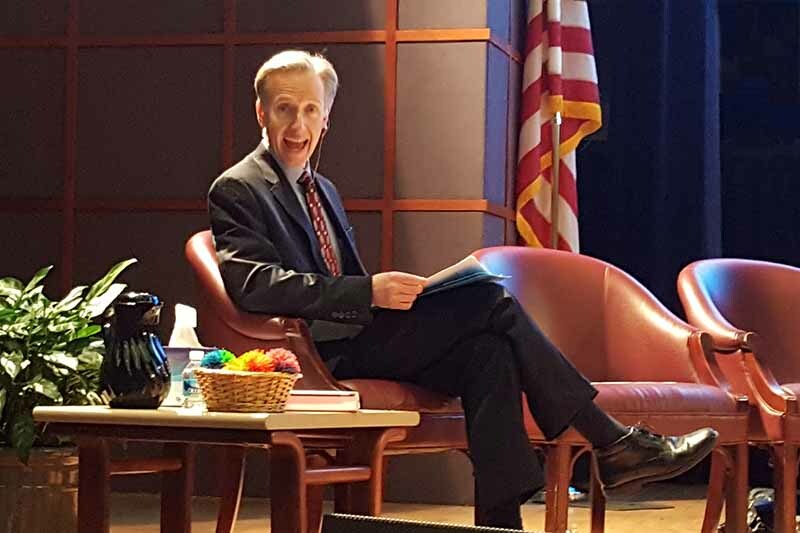 Jerry Sheehan clowns for the camera as he waits to facilitate the NLM Town Hall in February 2017. Lori Harris was equally pleased. Although she’s now the assistant director of the Donald C. Harrison Health Sciences Library at the University of Cincinnati, three years ago she was an NLM Associate Fellow. 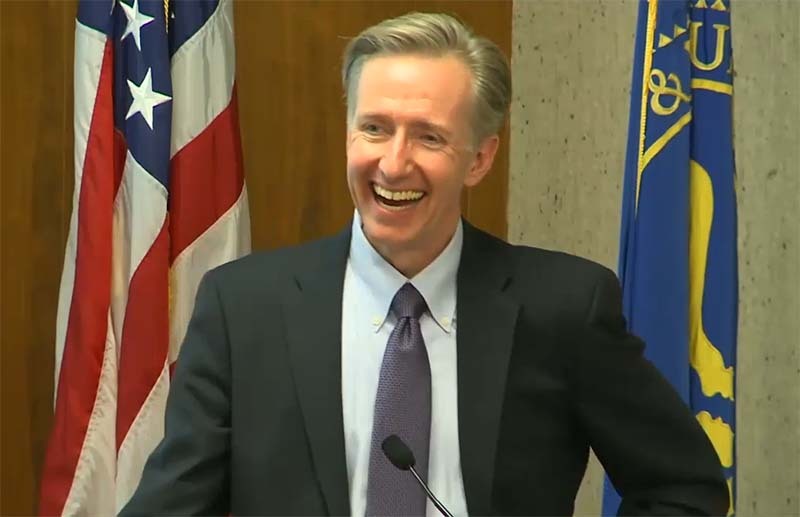 With his diverse portfolio stretching from academe to the National Academy of Sciences, from the White House to Paris and beyond, including groundbreaking policy work at NLM, Sheehan has engineered a career that will benefit NLM’s mission and people. August 15, 2017 in People.